A veteran First Amendment lawyer says that CNN should sue the White House for revoking press access from reporter Jim Acosta. Floyd Abrams, a constitutional law expert who has appeared frequently before the Supreme Court, told CNN's Brian Stelter on "Reliable Sources" Sunday that CNN has a case. "I think it's a really strong lawsuit," Abrams said. "I can understand CNN being reluctant to sue because the president keeps saying CNN is the enemy of me, and CNN might have reluctance to have a lawsuit titled 'CNN vs. Donald Trump.' That said, yes, I think they should sue." Abrams said. Last Wednesday, The White House suspended the CNN chief White House correspondent hours after Acosta pressed Trump at a press conference. Acosta was forced to turn in his Secret Service "hard pass." which speeds up entry and exit from the White House. Abrams said Acosta's ouster sets a dangerous precedent. 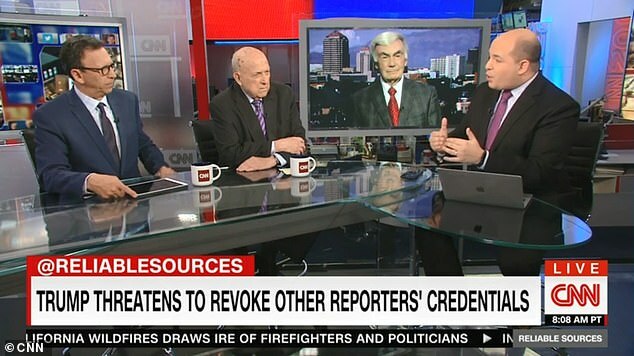 Former ABC White House reporter Sam Donaldson, who said he's been asked to prepare an affidavit to support CNN's case, said Trump's decision to revoke Acosta's credentials "is not only wrong and unfair, it's dangerous for the press as a whole." CNN said in a statement, "No decisions have been made. We have reached out to the White House and gotten no response." CNN previously said the move to bar Acosta "was done in retaliation for his challenging questions." The White House originally claimed that Acosta placed his hands on an intern who tried to take a microphone from him. Press secretary Sarah Sanders called it "inappropriate behavior." The video showed otherwise. CNN called Sanders' explanation a lie. "She provided fraudulent accusations and cited an incident that never happened," the network said. Abrams, the attorney, on Sunday said if the White House claims that Acosta "choked or touched this women — that's a very good reason" to revoke his pass. But, "it seems to be untrue," Abrams said. Video of the event shows that Acosta did not mistreat the intern. "Pardon me, ma'am," he said, when she reached for the mic. After asking another question, he gave her the mic.